Stay out of the stores and #optoutside! 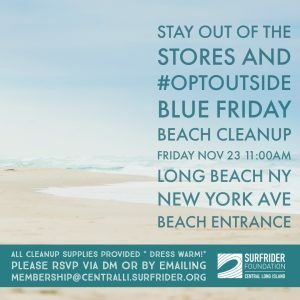 Meet at the beach entrance to New York Avenue beach on the west end of Long Beach for our Blue Friday cleanup on Friday, November 23rd at 11am. Complimentary hot beverage from our Ocean Friendly restaurant, Island Thyme, after the cleanup! Please message us at membership@centralli.surfrider.org to let us know if you will be joining!